If you’ve hung around this blog for a while, you’re probably aware that I love ice cream. I believe that ice cream is the perfect dessert that is in no way a summer-only treat, and is 100% meant to be consumed all year. I don’t care if it’s ten degrees outside – you will find me bundled up in front of the fire, next to all my fall decorations, holding a bowl of ice cream because it’s the love of my life (sorry, Bill). Not having ice cream in our freezer gives me anxiety because OHMYGOD WHAT IF I HAVE A CRAVING AND DON’T HAVE ICE CREAM TO SATISFY IT?! That’s why it’s always in my best interest to have some on hand, and the easy way to prevent myself from ever being in a code red situation is to make my own. I had gotten so used to making no churn ice cream recipes because my ice cream maker had died last year that it started to get a bit limiting. Thankfully, Bill bought me a new one for my birthday and I am BACK IN BUSINESS. Sorry for yelling, I’m just really excited about it. 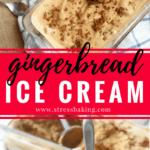 I realized recently that I don’t really have any seasonally specific ice cream recipes on here – and that’s probably because of my bias toward eating it year round. But that doesn’t HAVE to mean that I don’t have any flavors I can look forward to eating during a specific time of the year, right? Right. 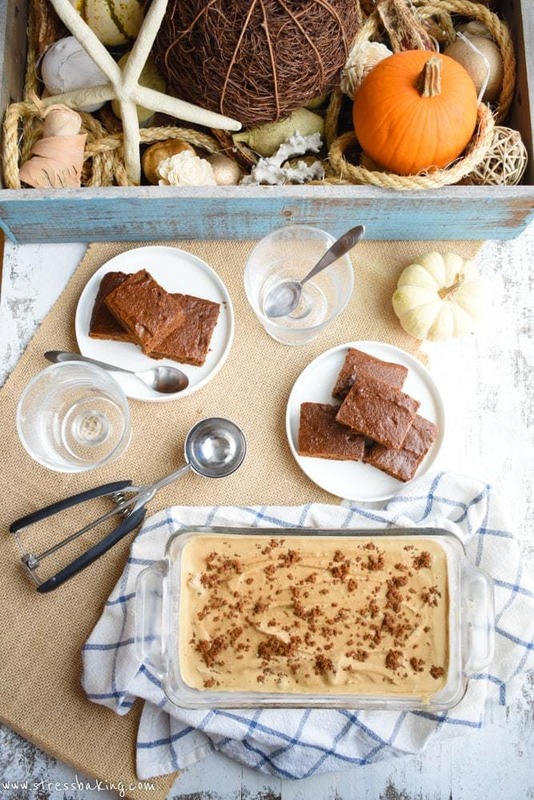 As I’m sure you’ve seen because you’re a loyal and amazing reader (no guilt trip here, just want to encourage you to be your best self), I recently posted this recipe for paleo gingerbread bars. Gingerbread is one of those things I just eat outside of the November and December months because it’s become sort of a sacred holiday food for me. The smell and taste of gingerbread bring me right into the mode of fallen leaves, crackling fires and family gatherings. I don’t want to taint that by making it commonplace during the rest of the year, so I save up all my gingerbread taste buds for the end of the year… and usually end up eating way too many gingerbread things. Some people overdo it with pumpkin, I overdo it with gingerbread. I make no apologies for my life decisions. And thus, this gingerbread ice cream was born. But because I’m me, the ice cream wasn’t enough. 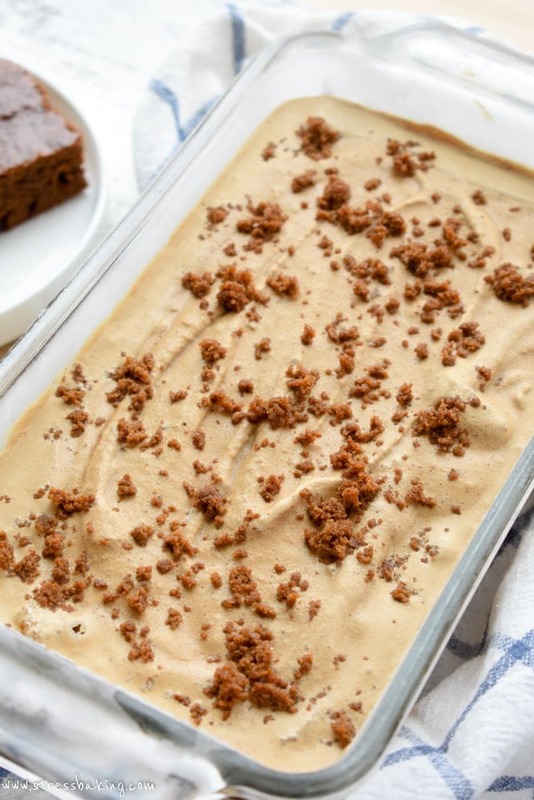 I had to add in some chunks of even more deliciousness in the form of these gingerbread bars. Chop ’em up, toss them in the freezer for a bit, and then add them in during the last few minutes of churning. And easy and — in my opinion — necessary step in the process for true ice cream perfection. Smooth and chunky, together in sweet harmony. They happen to be paleo, but this recipe is not – just want to make sure I’m setting the right expectations here. 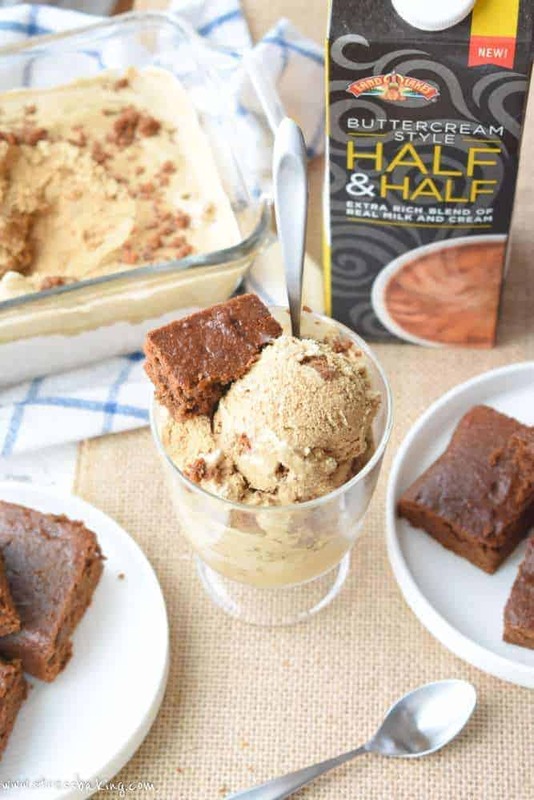 While the chunks of real gingerbread are a must, the real star of the show here is the brand new Land O Lakes® Buttercream Style Half & Half that I use in the recipe. I’ve seen plenty of recipes in the past that use a mix of heavy cream and half and half, but nothing about that combo really thrilled me. It didn’t give me the creaminess and extra rich blend of real milk and cream that I was looking for, and this Land O Lakes® Buttercream Style Half & Half NAILS IT. It’s exactly what I’ve been trying to find without even realizing it. Buttercream style is where it’s at, you guys. You have to trust me on this – it gives the ice cream this indulgently rich and creamy flavor that’s to die for. 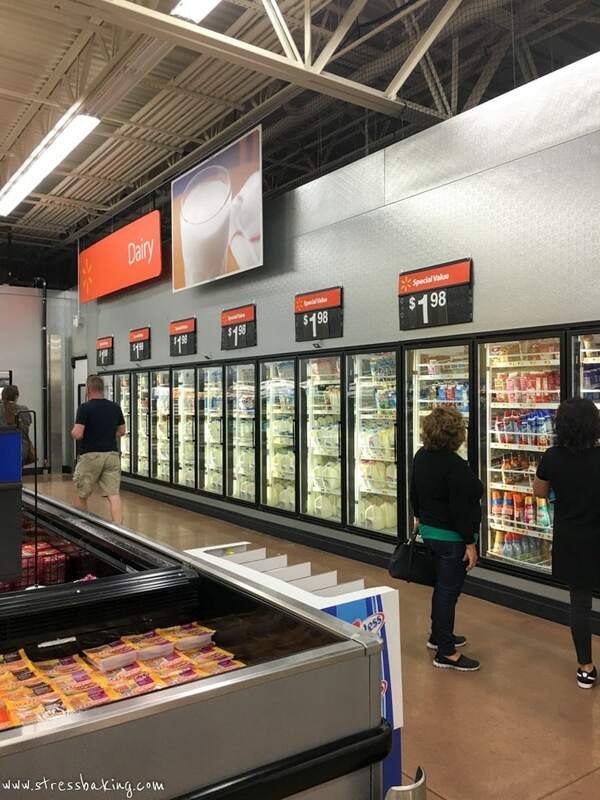 Where I live is a bit sparse on grocery selections, so instead of hopping from store to store looking for new products like this (only to be told they don’t have it yet) I just headed to Walmart’s dairy section to pick up a container of Land O Lakes® Buttercream Style Half & Half. 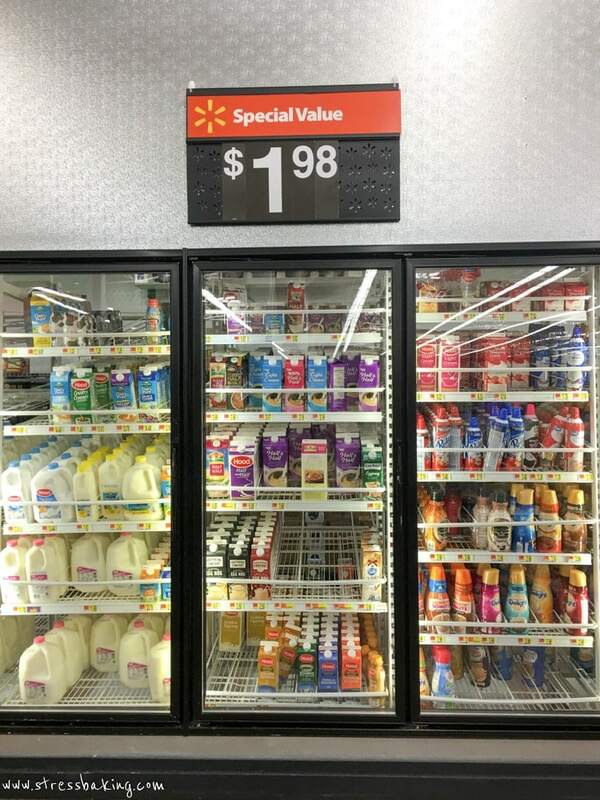 At my Walmart, it’s located at the very back of the store. The black container sticks out among the others, making it easy to find. I know this has nothing to do with the product inside, but I actually really like the design of the container. It’s simple, but bold. My creative side really enjoys a good package design, you know? This ice cream, you guys. It’s so good. 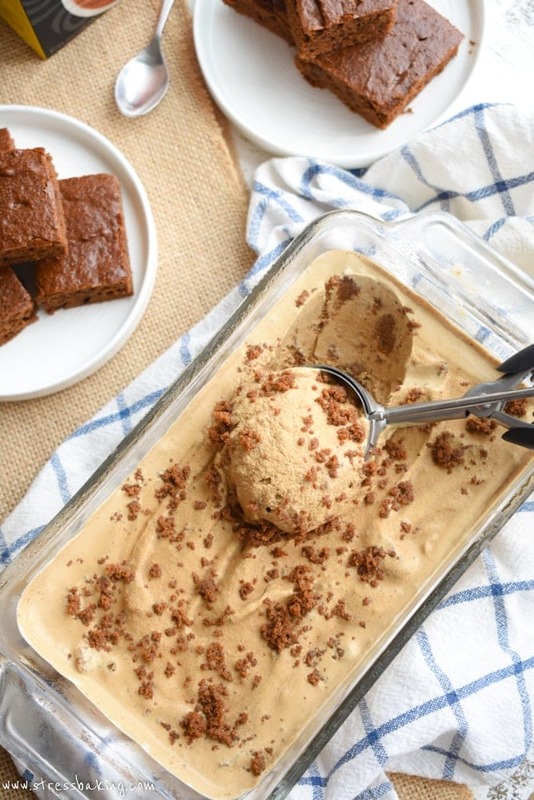 I just want to make another batch of these gingerbread bars and then add a layer of this gingerbread ice cream on top of it. And then maybe add a giant drizzle of molasses. AND THEN MAYBE ANOTHER LAYER OF GINGERBREAD AND ICE CREAM AND MOLASSES. I know I’ve said that it’s rich and creamy a lot already in the post, but IT IS and it deserves to be emphasized. No iciness here, aka: the bane of my ice cream-loving existence. I like to do this thing when I smoosh ice cream into the bottom of a glass serving dish so it’s sort of like a really thick milkshake, and then add scoops of ice cream on top of it. For some reason, being able to see the space in between the scoops of ice cream at the bottom bothers me, and this gives the ice cream a nice little cradle on which it can sit. Why yes, I do know that I’m completely weird – why do you ask? Wait… don’t answer that. I recommend following Land O Lakes® on Facebook and Pinterest because they share some pretty great recipe ideas. Not saying that you need inspiration for planning your holiday menus, but it couldn’t hurt. 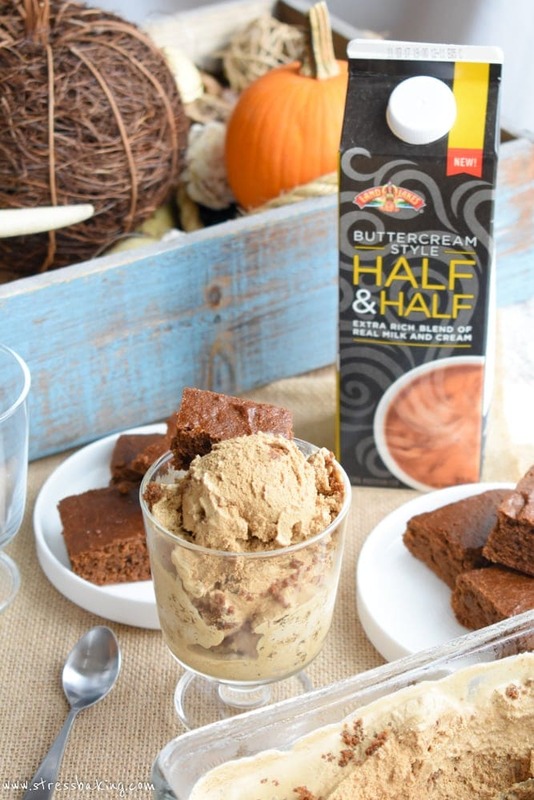 Now go do yourself a favor and pick up some Land O Lakes® Buttercream Style Half & Half and get to churnin’! Gingerbread on gingerbread – I love it! The texture of this ice cream looks freaking perfect. Cannot wait to try! I agree with you. Ice cream is not just for summer. 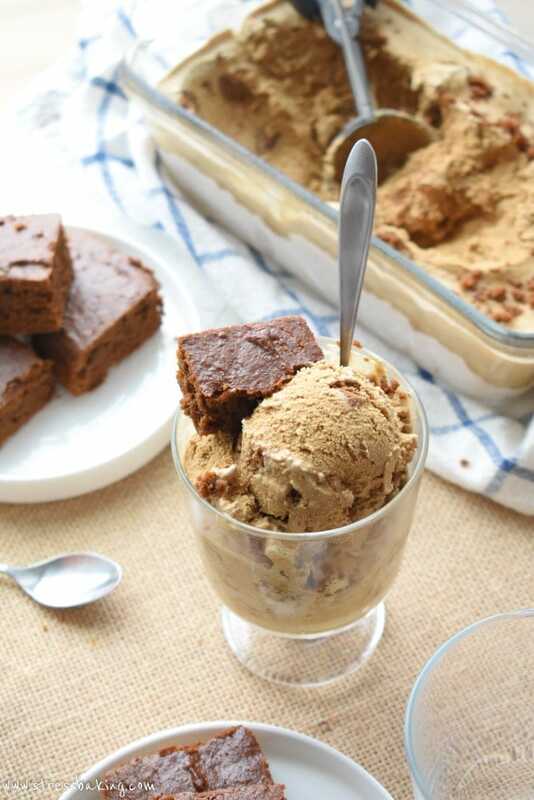 I personally love icecream with chunks it it, and I’m very fond of gingerbread, so I look forward to making this. Oh my goodness my husband just glanced over at my iPad and saw your photos and got all excited. We are making this right now. Love it! 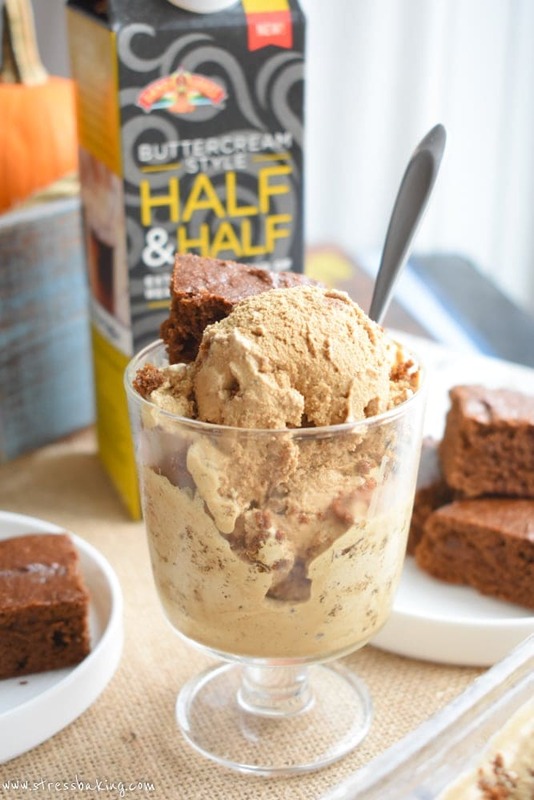 I have GOT to try that Buttercream Half and Half! 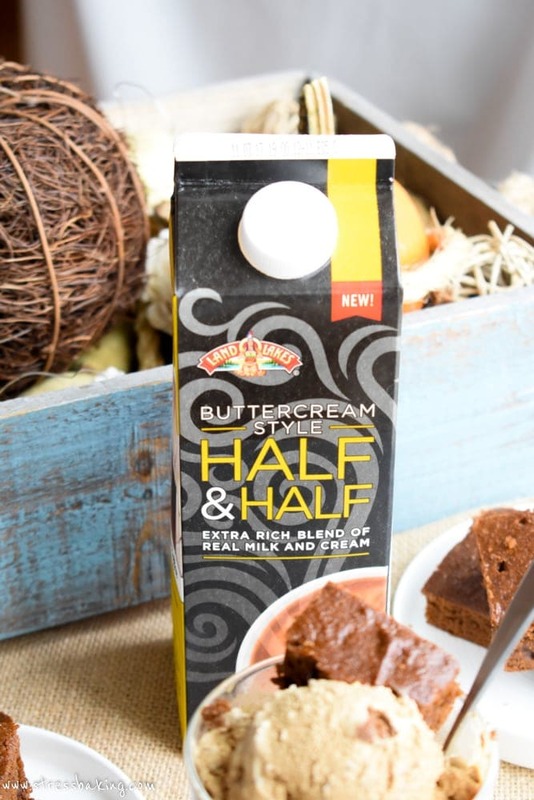 We are never without half and half in this house! Love this idea for a dessert made with it! I’ve been on a total molasses kick lately and just made a batch of gingerbread thumbprint cookies on Black Friday. I know what I’ll be making this week, especially since fresh cookies are needed, yum! We have a saying, “cold cuts cold” which would make ice-creams ideal for winters! 🙂 I love the smoothness of your ice-cream and it shouts out in all the pictures! No more icy bits! I have found using milk cream also helps. What a great dessert for the season. I love the taste of gingerbread!! And I have will power when it comes to sweets but ice cream is my weakness. Oh, I can pass on the store-bought stuff but this ice cream would not last long. I love making my own ice cream but haven’t thought of any holiday flavors to make this year. I believe this is going to be the one I try! Thanks for sharing. Oh no, now I wish I had an ice cream maker! 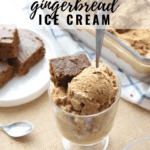 I love everything gingerbread, and this sounds just fantastic! I love mine SO much! 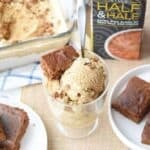 Hmm, what a clever idea to make icecream with half and half, I have never really thought of it before and yours looks pretty creamy. I will make this with my favorite ginger snaps, yum! 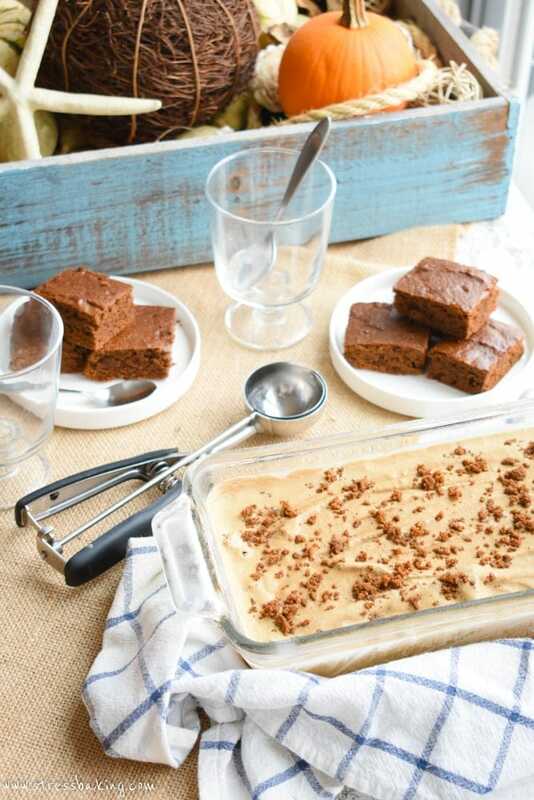 This just in…I had to buy bakery gingerbread, but I tried this recipe and it was AMAZING!!! This looks DELICIOUS! Unfortunately it’s impossible to find Land O Lakes here in Amsterdam. Any idea how I could substitute it? Thanks!